For other people named Sein Win, see Sein Win (disambiguation). Lt. Gen. Sein Win (Burmese: စိန်ဝင်း, pronounced: [sèiɴ wɪ́ɴ]) is the incumbent Minister of Defence of Myanmar (Burma), and the former Chief of Staff of the Bureau of Air Defence of Myanmar Army. He was appointed by military officials on 24 August 2015, along with the Minister of Border Affairs. ↑ Times, The Myanmar. "Daw Aung San Suu Kyi to join government as NLD reveals cabinet". www.mmtimes.com. Retrieved 6 May 2016. ↑ "Interesting story behind the article 'Who will be a new military chief?' | Eleven Myanmar". www.elevenmyanmar.com. Retrieved 6 May 2016. ↑ "Burmanet » The Irrawaddy: Army picks loyal generals to lead key ministries – Aung Zaw". www.burmanet.org. Retrieved 6 May 2016. 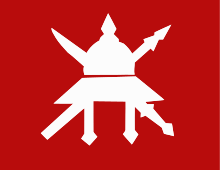 ↑ "Myanmar appoints defense chief, border affairs minister - China.org.cn". www.china.org.cn. Retrieved 6 May 2016.